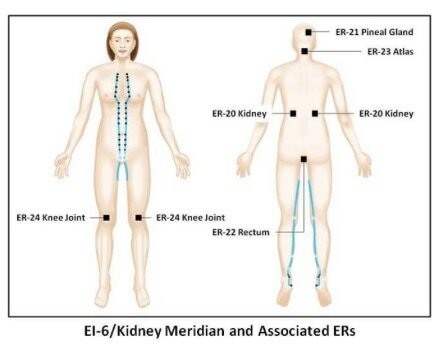 Clicking on ER20 Kidney in the NES Health Energy Screen, displays the other ER points associated with the kidney energetic pathways. The acupuncture meridian pathway is highlighted in blue. Pain or discomfort can occur anywhere along the pathway in addition to the organ system where there are energetic blockages. The kidneys form a vital part of the fluid maintenance of the body. The adrenal glands so vital in hormonal production and the management of stress, sit at the top of the kidneys. The kidneys filter waste products from the blood. Traditional Chinese Medicine gives the role of storing bio-energy to the kidneys and believe kidney energy affects the brain cell function and stamina on an energetic level. Balance in our lives and problems may be associated with a lack of balance in our masculine and feminine attributes or a lack of balance in our personal relationships. The main cause of this lack of balance is thought to be fear of loss or separation. Body/mind associations include seeing beyond the details, the obvious and the material and instead, moving to an expanded and greater view of the possibilities. The opposite imbalance may occur when we put undue pressure on ourselves or have unrealistic expectations. The cervical spine is associated with not feeling loved, it may prevent us from doing things for another that would show our love for them, and so avoids the pain of the love we give out not being reciprocated. The body/mind association for the knees suggest pride. Stiff unbending knees are associated with stubbornness and obstinance, while weak unstable knees represent low self-esteem and lack of pride in our own achievements. I move forward with confidence, and the support I need is found in abundance all around me. I release and forgive and move forward feeling safe in the world. I am secure in who I am, easily flow with change, and feel guided in my direction. I am flexible, flowing and accommodating. Energetic Driver 12 (ED12) Infoceutical has been designed to restore the kidney driver field where it has become depleted. Energetic Integrator 6 (EI6) Infoceutical has been designed to restore integrity to this integrator where field errors have disrupted its function.